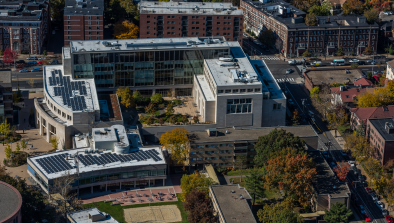 On-site solar PV, solar thermal, biomass, and geothermal installations play an important role diversifying Harvard’s energy supply. Installing solar panels on the lower roof of Wasserstein Hall at Harvard Law School. Harvard actively invests in and supports the transition to renewable energy sources as part of its commitment to climate action. In addition, our teaching and research across Harvard—in climate science, engineering, law, public health, policy, design, and business—is helping to accelerate the progression to renewable sources of energy. To complement the emissions reductions from energy supply and demand, the University purchased wind from Maine and existing hydro power from Massachusetts in 2016 as an interim step to meet our 2006-2016 climate goal (the other options identified were not needed as the on-site emissions reductions were larger than projected). Harvard’s Schools and administrative departments have installed a wide variety of renewable and alternative energy systems on campus and on University-owned property. The alternative energy installations (such as solar thermal and geothermal) reduce Harvard's fuel purchases and therefore reduce emissions. The renewable energy installations generate renewable energy credits (RECs). A REC is a tradable environmental commodity that signifies that one-megawatt hour (MWh) of electricity was generated by a renewable resource and delivered to the grid. A REC represents the environmental benefits of renewable generation. Only the owner of the REC can claim the environmental benefits of the renewable energy generation to avoid double-counting. Harvard retains the majority of the RECs generated from these on-site installations for regulatory compliance, but also sells some of the RECs to third parties. Note: Harvard was responsible for installing the solar PV project on the roof of the Arsenal Mall in 2009. However, the rooftop array is no longer owned by Harvard because the building was sold by Harvard in 2013. 153 solar PV panels installed on the roofs of the Ofer Building, the Wexner Building, and the Rubentstein Building in February of 2018. 53,800 kWh estimated annual production. View real time statistics. Estimated 114,000 kWh/year. Electric offset equal to total annual consumption at Dane Hall. Domestic solar hot water. Pressurized glycol solution system with 28 collectors serving Esteves Hall and future Chao Center. Expected to avoid 57,800 lbs of CO2 emissions annually. Thermal biomass system. Read about the project in the Harvard Gazette or visit the Harvard Forest website. Program uses human energy to produce electricity (spin class bicycles tied to generators which are tied back to the building grid) at Harvard Business School's Shad Hall gym. Heat is recovered from the steam tunnels under Canaday Hall as part of solar and steam heat recovery system. As a licensed retail supplier of electricity, Harvard directly purchases energy from renewable sources to meet both regulatory compliance requirements and the 2006-2016 climate goal. Harvard was an early leader in investing in renewable energy and off-site emissions reduction through the long-term PPA it signed in 2009 for 12MW of power and RECs from the Stetson II wind project in Maine. The University was required by legislation to purchase RECs each year to meet compliance standards, but made the leadership decision to invest in a long term contract for the energy plus RECs from a new wind project, and the University was one of the first organizations to voluntarily make a large scale Power Purchase Agreement (PPA), now a common model for corporate renewable energy buyers. With this purchase, Harvard became the largest purchaser of wind energy by a higher education institution in New England at that time. Harvard has a 15-year agreement with First Wind to purchase half the energy and RECs generated at the Stetson Wind II wind facility in Maine. As a licensed retail supplier of electricity, Harvard is subject to the Massachusetts Renewable Portfolio Standard (RPS) and the Alternative Portfolio Standard (APS) which require a specific percentage of electricity generation to come from renewable energy sources. Harvard’s requirements under the RPS and APS will increase to approximately 22% of total electric load in 2016. (Other retail suppliers of electricity, such as Eversource and National Grid, are also subject to these same requirements.) Harvard uses a combination of RECs from on-site projects, direct renewable energy contracts, and RECs purchased from third parties to meet these requirements. 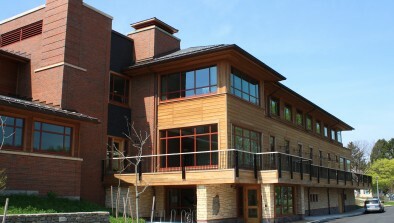 Harvard Schools and departments also purchase RECs in order to obtain points for the Leadership in Energy and Environmental Design (LEED) certification process. These are generally one-time REC purchases to cover two years of electricity use in the buildings. On campus, we are also transitioning to a cleaner energy supply. Harvard’s Blackstone Steam Plant and chilled water plants were both upgraded to improve efficiency and reduce emissions. Fuel switching to natural gas + Combined heat and power + Additional utility efficiency upgrades = 20,500 MTCDE reduction, equivalent to taking over 4,300 cars off the road.